Today at the trailhead I got to meet this beautiful couple. 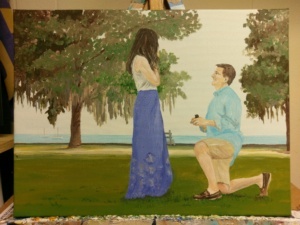 I painted this painting for them and they were given it at their engagement party. So today they stopped by to tell me how much it was perfect for them and how much they loved it. . It made my day to see how happy the painting made them. Yay! Our family surprised us with this beautiful painting that Carol made for us and we love it! The moment of our engagement will always be a such a happy and special moment to both of us and now we have this beautiful painting to decorate our future home with! We loved that we could meet you on the trailhead too 🙂 Thank you so much, Carol! We highly recommend CPF paintings!